Quick Start: Provide a quick start with MONARC. The source code of MONARC is divided in several modules with dedicated Git repositories. a front office: for the management of the risks analysis. A front office instance can be used without the back office. If you want run your own risk analysis you only need the front office. More information about the installation in this section. 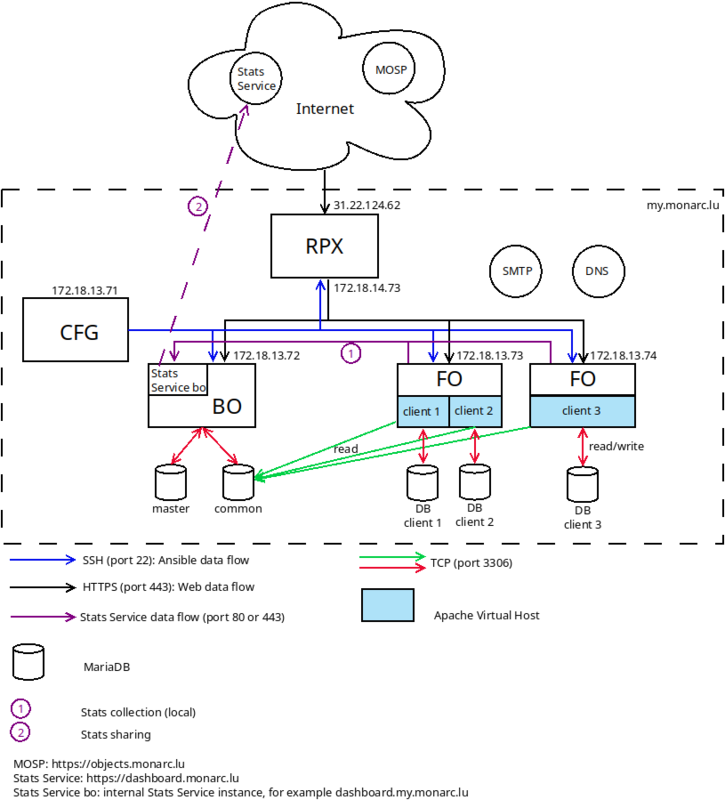 The whole architecture includes an additional reverse proxy (RPX) and a configuration server (CFG). It is possible to connect many front offices (FO) to one back office (BO). The deployement is managed with ansible. More information in the repository of the ansible playbook. Note that the common database of the BO is listening on 0.0.0.0:3306. It is strongly recommended to use a TLS certificate on the reverse proxy in order to provide a HTTPS connection between Internet and the reverse proxy. In our example, a TLS certificate for my.monarc.lu is used. The configuration server (CFG) manages the configurations of the back office, reverse proxy and different front office(s) via SSH. The reverse proxy (RPX) should of course be available from Internet. The DNS is important for the reverse proxy in order to resolve the FQDNs of the servers inside the network. Through the reverse proxy you should be able to contact the BO and the FOs from Internet. No need to able able to contact the configuration server from the outside. The database common of the BO should also be available to the FO servers. Postfix should be installed on the BO and on the FO. Indeed, SMTP is used for the account creation and the password recovery. The easiest configuration is to set up Postfix for relaying emails through your internal mail server (SMTP). Postfix, or an equivalent software, is required for the account creation and password recovery features. But all connections (for the BO and FOs) will go through it. Mainly used for the creation of clients on the different FOs. Of course these values are minimum requirements. MONARC can be installed on a Raspberry Pi. It is always better to forecast more memory and disk space for MONARC (front office) since it will host the data of the analysis. The deployment on the different servers requires an Internet connection since the updates are retrieved from our GitHub repositories. If this is hardly possible in your environment due to an internal policy, you need to configure a proxy in order to access to Internet. This is an important requirement since all MONARC updates, including security updates, are provided from the Git repositories. The ansible playbook also needs an Internet connection in order to dynamically deploy new clients. Is is strongly advised to use a TLS certificate. In the case you are using MONARC with a back office you can set the certificate on the reverse proxy. The ansible playbook is compatible Let’s Encrypt auto-renew certificates. You will find more information in the ansible playbook. If you are not using a back office you can simply configure the certificate on the front office server. If you want to install MONARC to manage your risk analysis. A virtual machine for use with VirtualBox is available. The best way if you want an up-to-date version of MONARC. If you want to install MONARC and the back office. This is useful if you plan to manage several clients. If you want run your own risk analysis you only need the front office. More information about the installation in this section. The whole architecture can be deployed with ansible. Postfix on the BO and all FO servers (for the password recovery feature of MONARC). The variable monarc_sql_password is the password for the SQL database on the BO. ansible will install and configure the back office, the front office and the reverse proxy. Consequently the configuration server should be able to contact these servers through SSH. You will find more information in the ansible playbook. This cron task should be launched on the configuration server by the ansible user. If a new client is created via the web interface of the back office, this task will instantiate a new MONARC instance (new database, new Apache VirtualHost and eventually a new server) for the newly created client. If this file is not present, a warning message will be displayed during the update. Keep the software of your distribution up-to-date (Apache, PHP, MariaDB, Postfix, etc.). At least the security updates from the GNU/Linux distribution. Updates from the last stable release of MONARC will be retrieved. pull updates for node_modules/[ng_anr, ng_backoffice/ng_client] via Git or Npm. Please be aware that by default the update script will run database migrations (for "big" and "small" upgrade). This behavior can be changed by passing the -b option to the update script. When MONARC is connected to a back office and has been deployed with the ansible playbook, three steps are required for a full proper update. Always use the ansible user.